* FOR 3rd GRADERS ONLY! 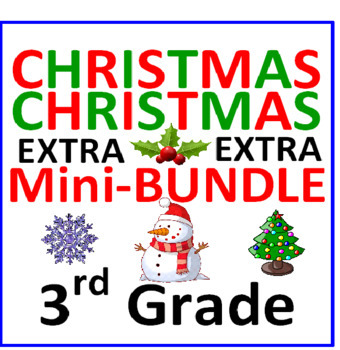 * You receive 6 worksheets 3 items all dealing with CHRISTMAS for your 3rd graders. 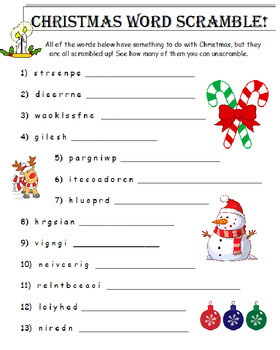 - Worksheets 1 & 2 – CHRISTMAS SCRAMBLE : 28 Christmas words all scrambled up! Your students must unscramble the words and spell them correctly. Good “mind-work!” NOTE:IF these words are too hard for your students, you can give them the first letter of each word to help them along! 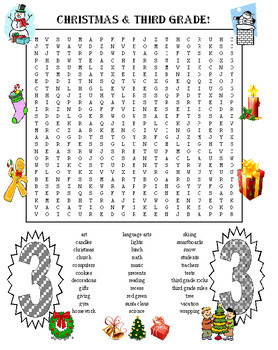 - Worksheet 3 : CHRISTMAS 3rd GRADE WORD SEARCH : 32 words in this HUGE CHRISTMAS PUZZLE all about 3rd graders! Students will enjoy searching for words about THEMSELVES and CHRISTMAS! They know how to use these puzzles and you do too! 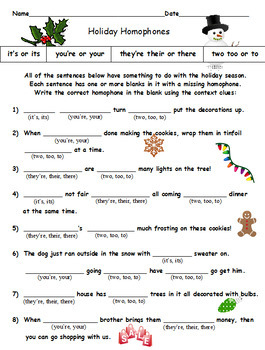 - Worksheets 4 – 6 : HOLIDAY HOMOPHONES : 62 Examples on 3 FULL worksheets! That’s 62 times your students must choose the correct homophone! THEY’RE, THERE, THEIR…IT’S, ITS…YOU’RE, YOUR…TWO, TOO, TO; 22 sentences with a TOTAL of 62 examples. All of the sentences on these 3 worksheets have something to do with the HOLIDAY SEASON. Each sentence has one or more blanks in it with a missing homophone. GREAT PRACTICE IN KNOWING (they’re, there, their) HOMOPHONES! * All worksheets are decorated with Christmas/Holiday images. Created and designed by David Filipek.